Eugene: It depends largely on the feedback we receive each day. Now it’s very hectic. We are chasing the contractors to rectify the defects before the expiry of the DLP [Defects Liability Period, which operates like a warranty for the school]. And the facilities and systems are still not really stabilized … There are a lot of defects at the new campus, as with all new buildings. Typically, [before we take over a new building,] we send a defects team in to check, and then get the contractor to rectify all the defects spotted. When the defects are satisfactorily rectified, we take over the space … But when we took over the facilities [of Yale-NUS College], we had a very short timeframe. In certain areas, there was literally no time to inspect the defects before we had to hand over to the departments. The rush was also partially because we had to move out from RC4 for the new RC4 people to take over the space. In a typical take-over of a building, it will take about 6 months to a year for the maintenance team to sort out the major “kinks” with the building systems. What attracted you to work at Yale-NUS College? Lau: The environment here is more fun, compared with an MNC [Multi-National Corporation, where I previously worked] with production and offices. Here you deal with more students, staff and faculty … you need to provide a lot of support. You also need to have the intellectual skills to communicate with them (laughs). What are the challenges of working in Facilities? Lau: When we go to ladies’ suites. Eugene: (laughs) We have an SOP [Standard Operating Procedure] for that. Knock on the door loudly before entering the suite. If there is no response, you unlock the door and stick just your head in and shout, “Maintenance! Coming in!” before entering the suite. And before entering into a student’s room, we knock one more time, this time on the room door. And if again there’s no response, we will shout “Maintenance! Coming in!” again. We don’t want to accidentally walk in when someone, especially a lady, is changing or is half-dressed, like in a towel. Lau: That’s why we’re very concerned when asked to enter female suites. Eugene: (laughs) More worried than the students are worried! Well, that’s one of the challenges of being an all-man team. Our job might be easier if we had a woman on the team. But the students have been most understanding and helpful. What would you like to say to everyone complaining about the long time it takes to repair malfunctioning facilities? Eugene: We’d like to ask for everyone’s patience. … We are not a big team. It’s good if students understand that we rely a lot on the contractors and parts’ availability. Lau: Coordination [with the contractors] sometimes takes time. Prasanna: Sometimes spare parts are not available and getting the contractor to indent them takes time. We have to keep pressing the contractor to bring in additional spares. Eugene: As much as we can, we try to minimize downtime. If parts aren’t available, we get the contractors to transfer working parts from one of the spare rooms to the affected student’s room. Contractors do not prefer doing this as it is only additional work for them, but we insist [on] it for the students. The DLP ends one year from May 2015. We will then have to call tenders for our own set of contractors, and with that we suppose there would be more direct control of the contractors. What’s the most rewarding part of your job? Any interesting stories to share? Lau: There are times when we pass students we’ve done things for, and they say “hi”. The appreciation is comforting. 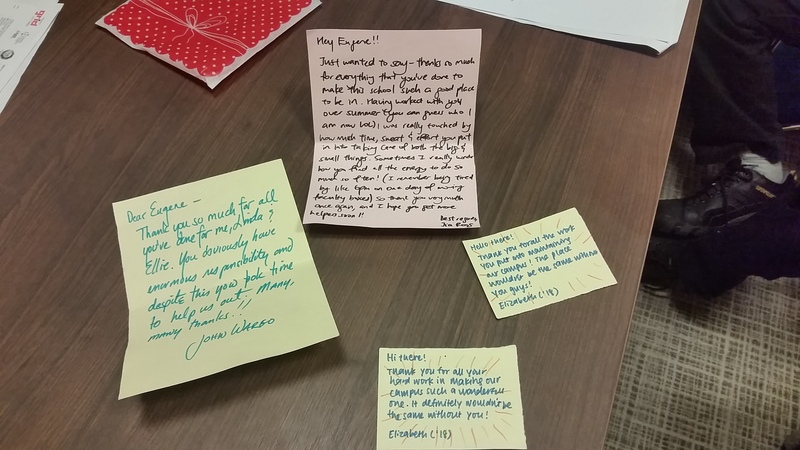 Eugene: When people are happy they don’t usually show it, but it’s nice that the Yale-NUS community does show their appreciation with their “Hi! Thank you!” when they walk past us. Prasanna: Some students and staff give us chocolates and sweets! Lau: Some of the people are nice. When we go to their suites for maintenance, they even offer us their makan (food). What do you do in Facilities? Lau: I take care of electrical services, defects rectification and support with installation works—my jobs are assigned by Eugene. Daily, we have different job assignments. Eugene: It can be anything, really. Cheng Yeow (L) mostly deals with the electrical systems. Prasanna deals with the air-con systems and other facilities such as the Building Management System, etc. There is a division of duties. How do things operate in Facilities? E.g. when an email about a spoilt air-con comes in, what are the procedures involved before you can get to work? Eugene: According to procedures, the Senior Executive will first respond with an interim reply. I am currently covering that job too because the Senior Executive hasn’t come on board yet. We will ask for basic details [of the problem], then arrange for contractors to fix the problem, accompanied by one of our staff. When possible, and where our schedule permits, we will follow-up with the student … to check that the repairs have been effective. Do you feel some of the problems students complain about are trivial? Eugene: We wouldn’t treat any feedback as trivial. As long as we receive feedback, we will act on it. … But we have to prioritize depending on how serious the problem is. If one student’s room has its power completely cut and he can’t study; and another student has an ant problem, [it’s] obvious the power outage will be attend to first. Lau: An interesting thing about Yale-NUS College: a lot of the parts used [in the facilities] are unique and proprietary. It’s difficult to find replacement parts when things spoil, so it takes longer for replacement. Eugene: That is sometimes the reason why some defects aren’t attended to as quickly as we would have preferred. All stairwells in the school have exhaust fans installed. This keeps them positively pressurized at all times: in the event of a fire, the stairways remain clear of smoke so people in the building can escape easily. Ant Problems Ants return to suites where they have previously found food, expecting more. Keep all food sealed up in plastic containers. Throw leftovers and half-eaten food out. Check your Voltage Different plugs from different countries have different voltages. Before plugging in, check that your plug has a voltage of 230V – the voltage used in Singapore. A 110V plug from the US could trip the power system. Clogged Drains Usually caused by trapped hair, clear a clogged drain by removing the square drain cover and manually removing the hair. Don’t want to get your hands dirty? Buy rubber gloves. Drain Flies Boil a liter of water in your suite kettle. Pour it sparingly down the sinks and drains in your suite – that’s where drain flies breed. Repeat this weekly.